The ever increasing presence of Muslims in the West and in the United States in particular, has made the media, general public, academic institutions, and government organizations pay more attention to Islam and the Muslim world. As a result, the Alavi Foundation has taken up the task of participating in dialogues concerning Islam and the West. To this end, the Book Distribution Program was established in 1981. 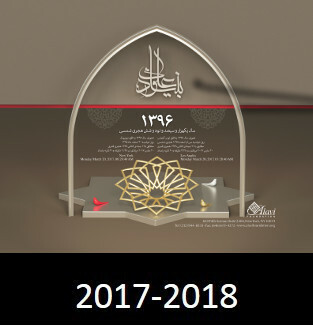 Through this program; the Alavi Foundation provided complimentary Islamic books to individuals, academic Institutions, public libraries, Islamic centers, and the penitentiaries within the United States. Currently, the Foundation receives over 14,000 requests for Islamic Literature per year and distributes more than 15,000 texts free of charge, per year. If you would like to receive Persian Books, please fill out this form. Shia Association of Bay Area Inc.
Alavi's popular and well-known calendar is again ready for distribution. Every year, we carefully read hundreds of feedback and improve the calendar. It was your request to prepare the calendar earlier so you have it before Nowruz. We are trying our best to make it happen this year! We request you to send a minimum of $10 contribution per calendar.